I missed this in my last update or two, but a couple of new guys, The Merciless Merchants (which makes me picture them as Ferrengi), have released a couple of modules over at DTRPG for the 2e Retroclone For Gold & Glory. Although I was a fan of Spelljammer and Birthright, the 2e rules always just felt "wrong" to me, though in retrospect, not nearly as wrong as later editions. It certainly does clean up a lot of the issues with 1e, though not all. So it has its points. 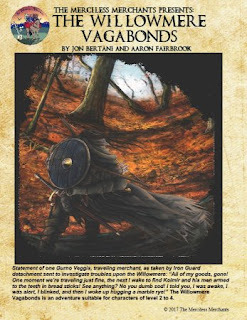 Anyway, the first module, shown above, is The Willowmere Vagabonds for levels 2-4, which sounds like the PCs must deal with bandits in a forest (hopefully more than that). Their second is The Nevermore Mines, which seems to be horror themed and is for levels 4-7. We agree with you!! We are a couple of new guys and as such prone to some mistakes.....we have reduced our prices, 7$ for The Willowmere Vagabonds and $6.66 for Nevermore Mines, but indeed, both are packed with art...we love art! We also are in agreement that approximately 60 pages of dealing with bandits in a forest might be pretty boring so....expect some twists, then turns...and maybe death.